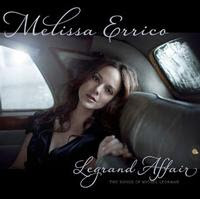 JP's Music Blog: CD Review: Melissa Errico Pays Tribute To Michel Legrand With "Legrand Affair"
CD Review: Melissa Errico Pays Tribute To Michel Legrand With "Legrand Affair"
Broadway star Melissa Errico is finally ready to release her new album which has been six years in the making. This album pays tribute to the legendary Michel Legrand which is where the album gets its title, the "Legrand Affair." The album was also produced by Phil Ramone. The fifteen songs on this album are perfectly selected to suit Errico's angelic voice, backed by a 100-piece orchestra. Some of the songs are classic Legrand compositions while other were newly written for this album by Alan and Marilyn Bergman. Errico's smooth, sultry voice never strays far from her comfort range, but with a voice that sounds like this, there is no need to stray. Her singing on the songs "The Summer Knows" and "I Will Wait For You" just put you in the mood for love, while the Oscar-nominated song "What Are You Doing The Rest of Your Life?" is just a wonderful balance of music and lyrics. You can't help but listen so intently to this album as it ends with the Johnny Mercer penned "Once Upon A Summertime" and the Eddy Marnay written French masterpiece, "Celui-la." The album was released on October 18 through Ghostlight Records. Also check Melissa's website (melissaerrico.com) for up-to-date information about the new album. Thank you for taking the time to recognize such a unique CD. I just got mine yesterday and was floored by it.